Valencia rice takes its name from Valencia, a province of Spain. The city of Valencia is a prominent seaport famous for its seafood, and especially its Paella Valenciana. Valencia rice is also known as short grain rice, pearl rice, or occasionally as round rice. Mahatma Valencia rice cooks up tender and moist, tending to cling together due to its high starch content. It is used for traditional Spanish dishes like Paella and Arroz con Pollo (chicken and rice) as well as soups, stews, stuffings, rice molds, croquettes, sushi, rice pudding, and other desserts. Mahatma Valencia may also be substituted in risotto recipes calling for imported Arborio rice. Mahatma Valencia rice is Kosher approved and is naturally sodium free, cholesterol free, and fat free. 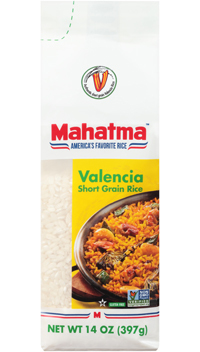 Mahatma Valencia rice is only available in Florida. It's easy to prepare, economical, versatile, and a healthy complement to any meal. Bring 1-3/4 cups of water to a boil in a 2 quart heavy saucepan. Add margarine and salt, if desired. Stir in 1 cup rice. Cover, reduce heat and simmer for 20 minutes or until all water is absorbed. In a 2 quart microwave safe dish combine water and rice. Add margarine and salt, if desired. Cover and microwave on HIGH for 5 minutes. Reduce setting to 50% power, microwave for 15 minutes or until all the water is absorbed. If your microwave does not have variable power settings follow manufacturer's directions. For drier rice, use 1-1/2 cups water. Or, for moister rice, use 2 cups water.